While attempting the first ascent of Mount Everest, his climbing partner George Mallory and he disappeared somewhere high on the mountain's northeast ridge. The pair was last sighted only a few hundred metres from the summit, and if the pair reached the summit before they perished is unknown. Mallory's body was found in 1999, but Irvine's body has never been found. He was also a keen sportsman and particularly excelled at rowing. His prodigious ability as a rower made him a star of the 1919 'Peace Regatta' at Henley with the Royal Shrewsbury School Boat Club, and propelled him to Merton College, Oxford, to study engineering. At Oxford, he joined the Oxford University Mountaineering Club, and was also a member of the Oxford crew for the Oxford and Cambridge Boat Race in 1922 and a member of the winning crew in 1923, the only time Oxford won between 1913 and 1937. In 1923, Irvine took part in the Merton College Arctic Expedition to Spitsbergen, where he excelled on every front. The expedition's leader, Noel Odell, and he discovered that they had met before in 1919 on Foel Grach, a 3000-foot-high Welsh mountain, when Irvine had ridden his motorcycle to the top and surprised Odell and his wife Mona, who had climbed it on foot. Subsequently, on Odell's recommendation, Irvine was invited to join the forthcoming third British Mount Everest expedition on the grounds that he might be the "superman" that the expedition felt it needed. He was at the time still a 21-year-old undergraduate student. Irvine set sail for the Himalayas from Liverpool on board the SS California on 29 February 1924, along with three other members of the expedition, including George Mallory. Mallory later wrote home to his wife that Irvine "could be relied on for anything except perhaps conversation". During the expedition, he made major and crucial innovations to the expedition's professionally designed oxygen sets, radically improving their functionality, lightness, and strength. He also maintained the expedition's cameras, camp beds, primus stoves, and many other devices. He was universally popular, and respected by his older colleagues for his ingenuity, companionability, and unstinting hard work. The expedition made two unsuccessful attempts on the summit in early June, and time remained for one more before the heavy snowfall that came with the summer monsoon would make climbing too dangerous. This last chance fell to the expedition's most experienced climber, George Mallory. To the surprise of other expedition members, Mallory chose the 22-year-old inexperienced Irvine above the older, more seasoned climber, Noel Odell. Irvine's proficiency with the oxygen equipment was obviously a major factor in Mallory's decision, but some debate has occurred ever since about the precise reasons for his choice. Mallory and Irvine began their ascent on 6 June, and by the end of the next day, the pair had established a final two-man camp at 8,168 m (26,800 ft), from which to make their final push on the summit. What time they departed on 8 June is unknown, but circumstantial evidence suggests that they did not have the smooth, early start that Mallory had hoped for. Noel Odell, who was acting in a supporting role, reported seeing them at 12:50 pm – much later than expected – ascending what he believed was the Second Step of the northeast ridge and "going strongly for the top", although in the years that followed, exactly which of the Three Steps Odell had sighted the pair climbing became extremely controversial. Whether they reached the summit has never been established . They never returned to their camp and died somewhere high on the mountain. The discovery of Mallory's body in 1999, with its severe rope jerk injury about his waist, suggests the two were roped when they fell. Irvine's body has never been discovered. In 1933, some 9 years after the disappearance of Mallory and Irvine, Percy Wyn-Harris, a member of the fourth British Everest Expedition discovered an ice axe around 8,460 m (27,760 ft), about 20 m below the ridge and some 230 m before the First Step. It was found lying loose on brown 'boiler-plate' slabs of rock, which though not particularly steep, were smooth and in places had a covering of loose pebbles. The Swiss manufacturer's name matched those of a number supplied to the 1924 expedition, and since only Mallory and Irvine had climbed that high along the ridge route, it must have belonged to one of them. Hugh Ruttledge, leader of the 1933 expedition, speculated that the ice axe marked the scene of a fall, during which it was either accidentally dropped or that its owner put it down possibly to have both hands free to hold the rope. Noel Odell, the last man to see Mallory and Irvine on their ascent in 1924, offered a more benign explanation: that the ice axe had merely been placed there on the ascent to be collected on the way back in view of the fact that the climbing ahead was almost entirely on rock under the prevailing conditions. In 1963, a characteristic triple nick mark on a military swagger stick, found among Andrew Irvine's possessions, was found to match a similar mark on the ice axe's shaft, making it likely that the ice axe belonged to Irvine, although some doubt exists as to whether the marks were present on the ice axe when it was discovered. 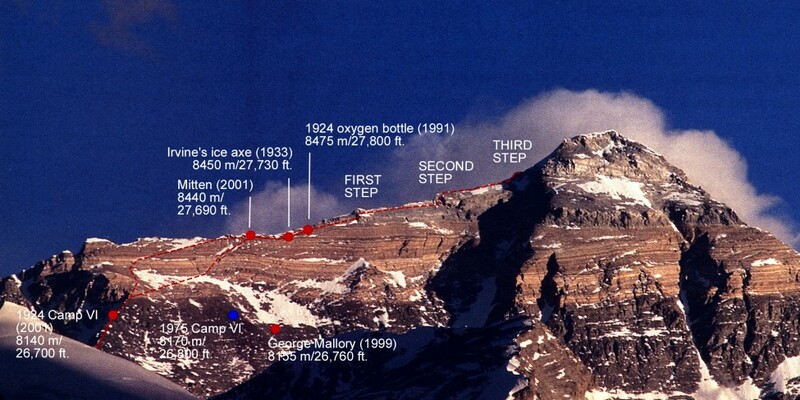 In May 1991, a 1924 oxygen cylinder was found around 8,480 m (27,820 ft), some 20 m higher and 60 m closer to the First Step than the ice axe found in 1933 (although it was not recovered until May 1999). Since only Mallory and Irvine had been on the NE ridge in 1924, this oxygen cylinder marked the minimum altitude they must have reached on their final climb. In May 1999, Mallory's body was found at 8,155 m (26,760 ft) by the Mallory and Irvine Research Expedition, in a funnel-shaped basin on the "8,200 m Snow Terrace", some 300 m below and about 100 m horizontal to the location of the ice axe found in 1933. The remains of a rope still encircled his waist, which exhibited serious haemorrhaging, indicative of a strong rope-jerk injury, and strongly suggesting that at some point either Mallory or Irvine fell while they were still roped together. Mallory was found with relatively few major injuries, compared to a number of modern climbers who had fallen the full distance from the NE Ridge and who were found very broken up, suggesting he had survived this initial fall, and suffered a further accident. The presence of a golf ball-sized puncture wound in his forehead seemed to be the likely cause of death, and could have been inflicted by an ice-axe. It has subsequently been speculated that an injured Mallory was descending in a self-arrest "glissade", sliding down the slope while dragging his ice-axe in the snow to control the speed of his descent, and that his ice-axe may have struck a rock and bounced off, striking him fatally. In 1979, Ryoten Hasegawa, the leader of the Japanese contingent of a Sino-Japanese reconnaissance expedition to the north side of Everest, had a brief conversation with a Chinese climber named Wang Hong-bao, in which Wang recounted that whilst on the 1975 Chinese Everest Expedition, he had seen the body of an "old English dead" at 8,100 m, lying on his side as if asleep at the foot of a rock. Wang knew the man was English, he said, by the old-fashioned clothing, rotted and disintegrating at the touch, and poked his finger into his cheek to indicate an injury. However, before more information could be obtained, Wang was killed in an avalanche the following day. Wang's 1975 sighting was the key to the discovery of Mallory's body 24 years later in the same general area, although his reported description of the body he found, "hole in cheek", is not consistent with the condition and posture of Mallory's body, which was face down, his head almost completely buried in scree, and with a golfball-sized puncture wound on his forehead, leaving open the possibility that Wang may have seen Irvine instead. The second Mallory and Irvine Research Expedition in 2001 discovered Wang's 1975 campsite location and made an extensive search of its surroundings, and found that Mallory's remained the only body in the vicinity. One explanation of the apparent discrepancy between Wang's description and the state Mallory's body was discovered in, is that Wang, having discovered the body face up, may have turned the body over to effect a simple burial. However, a more contemporary account, not dulled by the passage of 40 years, has subsequently surfaced. In 1965, a member of the 1960 Chinese expedition, Wang Fu-chou gave a lecture in the headquarters of the USSR Geographical Society in Leningrad. While describing the expedition, Wang Fu-chou, made a sensational remark: "At an altitude of about 8,600 meters we found a corpse of a European". Asked how he could be sure the dead man was European, the Chinese climber replied simply, "He was wearing braces". In 2010, a team informally dubbed the Andrew Irvine Search Committee led by American Everest historian Tom Holzel conducted a new photographic search for Irvine using a computer-assembled montage of aerial photographs taken in 1984 by Brad Washburn and the National Geographic Society. This search led to the identification of a possible object at about 8,425 metres, less than 100 m from the ice-axe location, consistent with a body lying in a slot of rock, feet pointing toward the summit, just as Xu described his sighting. Arnold Lunn, one of Irvine's friends, wrote: "Irvine did not live long, but he lived well. Into his short life he crowded an overflowing measure of activity which found its climax in his last wonderful year, a year during which he rowed in the winning Oxford boat, explored Spitsbergen, fell in love with skiing, and – perhaps – conquered Everest. The English love rather to live well than to live long". Events from the year 1902 in the United Kingdom. The 1924 British Mount Everest expedition was—after the 1922 British Mount Everest expedition—the second expedition with the goal of achieving the first ascent of Mount Everest. After two summit attempts in which Edward Norton set a world altitude record of 28,126 feet (8572m), the mountaineers George Mallory and Andrew "Sandy" Irvine disappeared on the third attempt. Their disappearance has given rise to the long-standing unanswered question of whether or not the pair climbed to the summit. Mallory's body was found in 1999 at 26,760 feet (8155 m), but the resulting clues did not provide conclusive evidence as to whether the summit was reached. Events from the year 1924 in the United Kingdom. See also Former students, Fellows and current Honorary Fellows of Merton College.Merton College, Oxford is one of the constituent colleges of the University of Oxford. This list of Merton Fellows and alumni is grouped into centuries; where the person's life spans more than one century, the (approximate) date of matriculation is used, and given in brackets when known.